Hara Dhania Chutney also called as green chutney / coriander chutney is a perfect accompaniment to serve with Indian chaats. In simple I should say this a versatile chutney. This vibrant chutney is a wonderful spread in any sandwich. Adds more taste when brushed on the grilled fish. Makes your kebabs or tikkis tastes simply exotic when dipped in it. Adds zing when used as a marinade for tandoori chicken,panner tikk i. Also try along with coconut and makes a delicious Coriander Coconut chutney that goes well with dosa / Idly. I bought a packet of fresh Indian gooseberry from Mustafa two weeks back when I went for my monthly grocery purchase. I never get a chance to try recipe with gooseberry before, the only incident I remember while penning this post, my mom use to lit a ghee lamp using it for kaarthika somvar( a special day for Lord Shiva), the whole day she takes fast and pray for us. Mothers are living God I should say in simple, they sacrifices and thinks about us more than we expect. Roasted Spiced Peanuts coated with gram-flour and spices. Hi all, wanna taste this hot and spicy fried Peanuts, sorry sorry baked peanuts with exotic Indian spices. Yes it's baked and can munch as many as without guilt. I love Indian spices that has a nice flavor and taste, that's why I use besan with chilli powder, garam masala and a generous pinch of chaat masala and amchur to give zingy, tangy effect. Toss all masala with peanuts and bake it. Enjoy the spicy masala groundnuts with a cup of Tea. Mushrooms are cooked in the spicy onion based gravy with coconut cashew flavour. Mushrooms are edible fungi, known as "Agaricus". It is suitable to make soup, starters, curry and more. The easy, tasty mushroom masala is perfect to go with hot roti. It's made with cubed mushrooms, simmer cooked in onion based gravy. To enhance the flavour and thicken of the gravy, here I used some coconut cashew paste. It gave nice twist to the entire gravy and we all enjoy the taste. Its a complete vegan food to enjoy with fresh rice. Yogurt Based Dip prepared with Mixed Fruits. Healthy and yummilicious mixed fruit raita is quick and easy to make. Its super easy to make and ideal for potluck or kids party. One bowl of this healthy yogurt -based fruits makes an amazing dessert. Simply prepare with the available fruits in your pantry and toss it up with your choice of dressing. For Variation, serve it with biryani/spicy rice or stuffed parathas as a side. Follow the recipe to learn how to make mixed fruit raita. Check for more Raita Recipes. Low Fat, Non Fried Fenugreek Fritters using Paniyaram Pan. Preparing homemade curd / yogurt is quite a simple task. All you need is knowing rite way to set , more importantly as thick as possible . The fresh homemade yogurt is tasty and less tart than store bought one. It is much economical and affordable when planing to set regularly at home. The tbsp of set yogurt can be reserved as a starter for next time use. Sukhadi is poor man's delight which is made with simple and easily available ingredients in every kitchen.Though being a healthy sweet itself, we can make it more rich and healthly by adding dryfruits and other ayurvedic herbs/inredients. In Gujarat, people make it specially in winter by adding other herbs to get all benefits. I like to have to as simple as it is along with other spicy/crunchy/munchy snack. Here comes the EzRecipe to make Sukhadi | God Papdi. Scrambled Idli seasoned with onion and chilli. Idli upma is always my favorite and its very easy to prepare too. 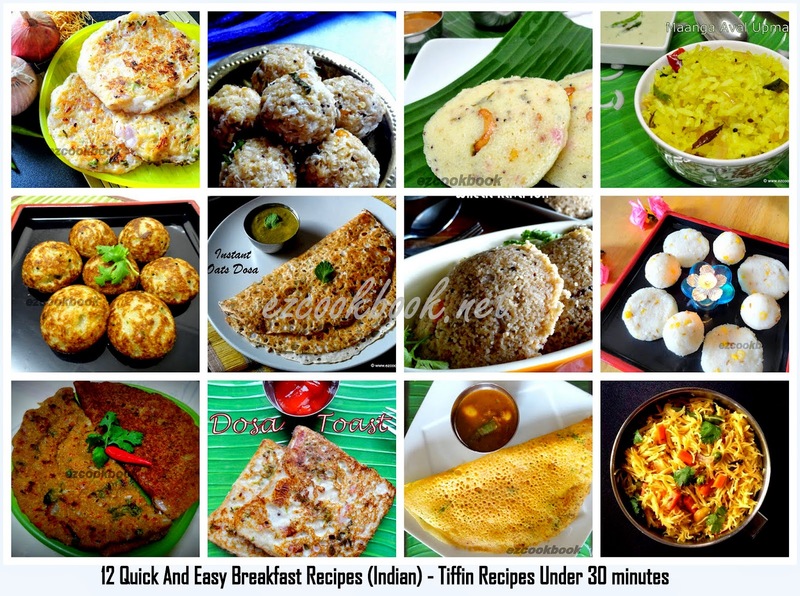 This post I want to draft for all bachelors who wants to try some instant tiffin. I also suggest it could be a perfect recipe to make use of some leftover Idly. I love to have Idli upma almost any time a day. Mothers can make it as a quick evening tiffin to their kids. Roasted lotus seeds seasoned with spice powder and chaat masala. Phool Makhana / Lotus Seeds are same and widely called as Foxnuts. The seeds are edible from lotus plant can be widely used in cooking both as sweet or savory, fried or roasted. Indian cuisines include this in making curry, pulao, dessert also it is a good substitute for thickening the gravies. The seeds taste neutral can blend with any food ingredients when cooked. Jackfruit Seeds and Sour Mango cooked in spicy coconut Gravy. This tempting kerala style chakkukkuru manga curry made me completely drool for it. And I found new way to utilize the seeds in making curry rather than adding in sambhar. Yes everytime my mom use to add the seeds in sambar. This is a humble guest post to our beloved blogger buddy Jagruti of Cooking Odyssey. Wow she is such a enthusiastic food blog writer. We always admire at people with deep passion, and she is one such woman passionate about cooking and food blogging. Just one visit is enough to stick on her site, oodles of delicious recipes will not allow you to leave her page.